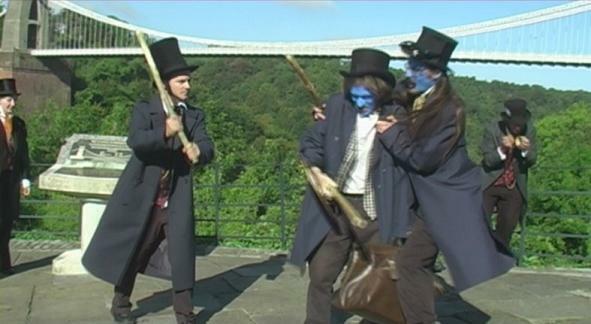 "The Nine Lives of Isambard Kingdom Brunel' performed at the Clifton Suspension Bridge"
On the 12th of September 2009, Bristol's Rag Morris Mummers presented a newly-written mummers' play entitled "The Nine Lives of Isambard Kingdom Brunel". 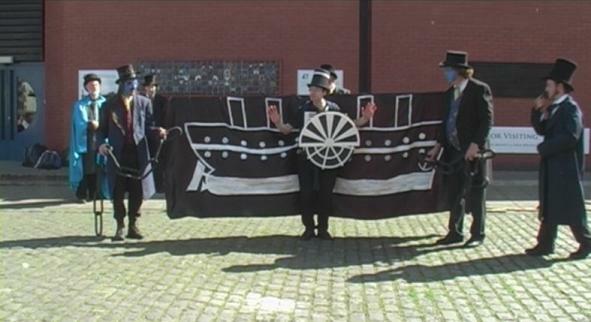 It was performed on Bristol's Doors Open Day at five Brunel-related sites; from a viewpoint looking out over the Clifton Suspension Bridge; to the Underfall Yard, where Brunel worked on the system for clearing the silt from Bristol's floating harbour; to the dockside next to Brunel's original iron-hulled steamship the ss Great Britain; Queen Square, scene of the 1831 Bristol Riots, when Brunel was sworn in as a special constable; and finally to the Old Station building at Temple Meads, where Brunel's broad gauge locomotives first arrived when he built his Great Western Railway from Paddington. 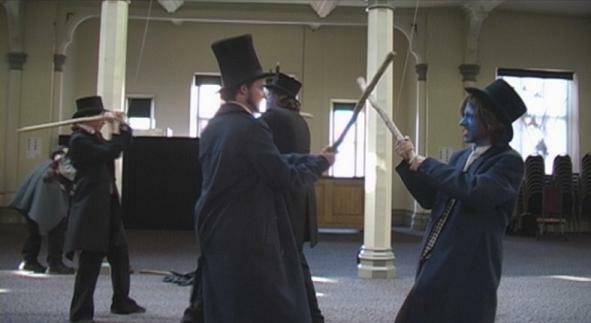 One final performance took place at the hands-on science centre, Explore-At-Bristol, on the evening of 15th September, exactly 150 years after the day that Isambard Kingdom Brunel died. Those of you who may be interested in such things may like to find out a little more about how this came to be; how the story came to be performed; why it was considered appropriate for Brunel's story to be presented using this format; and what made it a mummers' play. As the originator, scriptwriter and an actor in the play it's a project that has been part of my world for the last year or so; as it now begins to fade into its own history I thought it would be useful to reflect on the processes which went in to the construction of a mummers' play that would resonate with historical fact, be full of humour and adventure, be a respectful representation of a remarkable life and be relevant to a modern audience. Rag Morris is a mixed morris dance side based at the University of Bristol since 1981, who on special occasions perform mummers' plays. To be more specific, a side who used to perform both self-penned and traditional mummers' plays but who haven't really done so in public since 1994, although we have kept the idea alive by performing an unrehearsed play each year at our winter solstice party. In 1993, the year before I properly joined the side, Rag Morris performed a play written by Marc Vyvyan-Jones, with help from Roland and Linda Clare, based on the story of Vincent and Goram, two local giants who once carved out various local geological features including the Avon Gorge and a valley to the north of the city near Blaise Castle. The writers took an original legend and turned it into a mummers' play, with characters such as Old Father Time (rather than Old Father Christmas), the eponymous giants, the lovely Sabrina who became the River Severn, Doctor Jack Druid, and the character of Brunelzebub as the devil with the frying pan who pops up by the Clifton Suspension Bridge at the end to cadge for cash. Towards the end of 2008, for a scriptwriting challenge I thought I would set down on paper an idea I'd had festering for a play revolving around the world of morris dancing. Part of this would involve a play within a play; a mummers' play; because that's the kind of thing that morris dancers get up to. My idea, inspired by the Vincent and Goram play, was to find a story featuring another local hero which could be adapted into a mummers' play format in the same way. The character of Brunelzebub led me to think of Brunel himself; his devilish alter-ego could return to become the engineer's inner demon. One thing led to another and in an inversion of priorities, the mummers' play superseded the original idea to its eventual exclusion; not least because there was a real possibility that Rag Morris might be able to perform it. But how could this story best be told? Then I remembered - in 2006, as one of a series of events held around Bristol and the south-west to celebrate Brunel's 200th Birthday, an exhibition was installed at the Maritime Heritage centre next to the ss Great Britain on Bristol's harbourside, entitled "The 9 lives of I.K.Brunel"; a sister-project, called "The Forces that Made Brunel", was held at the Explore-At-Bristol science centre, where I work. The 9 lives exhibition was intended to paint a more human picture of Brunel by relating the stories of nine specific incidents in which Brunel either had a work-related accident or otherwise put his own life in danger. By dramatising these incidents we could take this one stage further. In order to tell a more complete version of Isambard's story and describe many of his challenges and achievements we'd look at nine stories in rapid succession; where Brunel had an accident, we could bring in the character of a Doctor who could offer an instant cure so he'd be on his feet again for the next instalment. These life and death incidents seemed to fit naturally into the format of a mummers play, and our overall performance would be that of nine short mummers plays strung together, with an overall introduction and conclusion. I was able to get access to some of the original designs and proposals for the "9 lives" exhibition. Of the nine incidents in the exhibition I used eight; the first one in the exhibition referred to Isambard growing up in poverty with his father Marc in a debtor's prison; this I substituted for a scene based on the Bristol reform riots. The other 'lives' would be based on the Thames tunnel flood; the crossing of the Avon Gorge in a basket; an accident involving a Great Western broad gauge locomotive falling from a crane; a fire on board the ss Great Western steamship leading to a fall into the engine room; a fall from a horse; a failed conjuring trick where a coin fell into one of Brunel's lungs and stayed there for some weeks; a battle between navvies and contractors at construction site of the Mickleton railway Tunnel; and the eventful story of the launch of Brunel's final steamship, the ss Great Eastern. To populate the play, I would surround Brunel by characters based on mummers' play archetypes. The play and the cast would be introduced by Old Father Thames, using some words adapted from Old Father Time's version of a standard Old Father Christmas speech. This character would represent the two rivers that ran through Brunel's career, the Thames and the Avon; he spent a great deal of time and effort tunnelling under them, building bridges over them, launching steamships into them or linking them together with his Great Western Railway. From a childhood rhyme, Doctor Foster would come back down the railway from sunny Gloucester, where the "Break of gauge" caused chaos when passengers and goods had to be transferred between the broad and standard gauge carriages and wagons. Brunelzebub would return, making this some kind of sequel, with Bold Slasher as his accomplice. Little Johnny Jack, with his family on his back, would work in tandem with Thames as narrators and provide the linking material from one story to the next. Old Leviathan, the original name for the Great Eastern, would be my name for the character who would arrive at the end of the play to relate the story of the fateful steamship. Leviathan, like Brunelzebub, was a name inspired by a biblical beast. As the play began to be written, certain other traits began to appear. There would be three "double acts"; of the hero and doctor; two narrators, and the two villains, who at times would represent workers, rioters, navvies, stokers and so forth. These six would perform a morris dance the end of the play, with Old Leviathan providing music, his accordion hidden behind a "paddle wheel". Doctor Foster perhaps at times also subtly embodied Brunel's supporters, such as his father or fellow engineers. Brunelzebub would keep an account book of the number of deaths that would result from Brunel's grand schemes, in a potentially ironic depiction of the reportage of such statistics. Brunelzebub and Bold Slasher would personify Brunel's "blue devils", as he described his fears and insecurities in his personal diary. To this end, these two characters would wear blue face paint to resemble woad warriors. In some ways the characters surrounding Brunel would represent different aspects of his own personality. They would all wear "Brunelian" outfits of frock coat, waistcoat and top hat, so that perhaps an audience might have trouble identifying the hero before his introduction - which one's Isambard? The frock coat and top hat is a standard costume for the mummers' play doctor character, so I felt it would be appropriate for all of our players; it would also make a distinction from the tattered shirts that Rag Morris normally wear. In some of the group photographs that still exist of Brunel with his colleagues, such as at the launch of the Great Eastern, this was the standard fashion for men of the time, and I wanted to recreate this look for our company of players both during the performance and when walking between venues. I did quite a bit of reading about Brunel's life and work in order to tell the story as factually as I felt was appropriate, within the confines of a rather silly half hour play. One of the first books I picked up was Brunel: A Graphic Biography, by Bristol-based writer Eugene Byrne and illustrator Simon Gurr. This had been distributed around Bristol for free as a "Big Read" for the Brunel 200 anniversary and brought his story visually to life with the humour of a comic strip and the adventure and excitement of a graphic novel. This inspired me to contemplate a new genre of street theatre - the Mummers' Play Biography! In particular, mention of the relationship between Brunel and his physicians, who treated him after his accidents and through his illnesses, sometimes with laudanum, even accompanying him on his final trip abroad to Egypt, reinforced the central relationship of the Mummers' play. The next book I turned to was "Isambard Kingdom Brunel: Engineering Knight-errant" by Adrian Vaughan. This biography presents a well-rounded portrait of Brunel, as a complex individual with shades of light and darkness, and also usefully described most of the events that made up the "nine lives" in some detail. In the nineteenth century, engineers such as Brunel, Telford and Stephenson were treated as national heroes; many were posthumously rewarded with tributes in Westminster Abbey. Brunel above others would set out on quests for seemingly impossible achievements - designing the longest bridges, fastest railways and biggest ships the world had ever seen. Contemporary critics would compare these quests to those of the Knights of Old. This gave weight to the idea that Brunel could take the place of a traditional mummers' play hero such as St George or Robin Hood. Many mummers' plays still performed today have scripts that were first recorded in the first half of the nineteenth century, and a few feature contemporary "historical" characters such as King George and "Boney". It seemed a natural period to set a mummers' play. One can only imagine whether or not Brunel, who himself was a keen performer, conjurer and amateur actor, may actually have seen such a play on his travels through rural England. When I started preparing to write this play in the autumn of 2008 I became aware that the 150th anniversary of Isambard Kingdom Brunel's death, on 15th September 1859, was less than a year away and would provide a significant occasion for the play to be performed in Bristol. The timescale for organising a performance with Rag Morris was just about right. The Saturday before the anniversary was Bristol's Doors Open Day, an occasion when a number of public and privately owned buildings allow the public inside for guided tours; attracting a potential crowd who might additionally be interested in experiencing some unique historical street theatre. Bristol has a number of well-known and lesser-known sites that played a part in Brunel's story, and the fives sites that were chosen reflect these while being appropriate locations for street performance. The cunning plan was explained to members of Rag Morris around the turn of 2009 and received immediate support. We eventually recruited eleven people to perform in the play, with many parts covered by more than one actor so we could swap around during the day, to involve more people than the cast of seven required and to give a bit of flexibility in case any particular members couldn't make a rehearsal or performance. I have to commend our entire cast for their showmanship and enthusiasm for the project; they were all well matched to their parts. As we got closer to the performances, the doctor's bag was populated with various cures, costumes were hired, props were found, made, bought and borrowed, some from Ashley's Rise mummers. Of particular note were the top-hatted family on Johnny Jack's back and the 1:50 scale replica of the Great Eastern that folded up into bat-wings for ease of transportation. We contacted the venues, Bristol City Council and Doors Open Day to ask if they would support our performances, which, after some discussion, they all did. Doors Open Day were kind enough to include us in their programme, of which thousands of copies were distributed to various public leaflet racks around Bristol. Performing on Council land required us to seek Site Events Licenses and Temporary Events Notices (T.E.N.s) and so forth, which, as morris dancers, we don't normally need, though four of the six eventual locations already had their own public entertainments licenses which saved us a bit of money for T.E.N.s. I was keen for an additional performance to take place at Explore-At-Bristol, but thought that five in one day was enough already for Doors Open Day. An additional performance on the actual 150th anniversary seemed like an appropriate way to conclude the life of our play, and we managed to combine this with a regular Tuesday evening event held monthly at Explore - a Science Café discussion. The format of the evening is normally a short presentation by an expert followed by a Q&A session. We approached Christine MacLeod, professor of History from the University of Bristol, who specialises in the history of technology. She proposed a title for our event that would lead to a discussion of the reputations of Brunel and his contemporaries, "When Engineers were Heroes". I had managed to name-check almost all of the locations where we were going to take the play, including, prophetically, the Mansion House. I was also imagining that there may be other places mentioned in the story where the play could be performed, perhaps including the Thames Tunnel museum or the Millwall launch site of the ss Great Eastern. Without taking Rag Morris down the Great Western Railway to Paddington Station, would there be other mummers' players already in London, who could possibly perform the same play on the same day? I got in touch with a few groups, but sadly the search proved fruitless. More positively, I discovered at an appropriate moment that the Bristol Poetry Festival was due to occur at the beginning of September, concluding the weekend of the 12th. Without even sending them a script, I was delighted when they offered to include us in their programme. Up to the point that I'd started writing the play, I'd not written a verse of rhyme since I was at school, but I found that compressing and abridging the story into bad puns and rhyming couplets was an entertaining challenge. I tried to match the words with a number of visual gags and dramatic reconstructions that were inspired by mummers' play and street theatre tradition. I hope that people were amused by the results, pitched somewhere between complexity and naivety. The script was gradually refined over the months after the first draft had been completed, adding and modifying a few words and lines here and there, bringing in a few more expressions from "traditional" mummers' plays. The final major adaptation was a reworking of the ending of the play to give all of the characters a chance to pay tribute to Brunel and to talk a bit more about his legacy. The last weeks of Brunel's life have the air of a Greek Tragedy about them; he collapsed with a stroke on board his Great Eastern steamship the day before she was due to depart on her maiden voyage; and he received the news of a tragic explosion on board a few days before his own death. The first draft of the script jumped straight from Brunel's collapse to the final doctor's speech, but then I had the idea the Brunelzebub would have the final victory by being the one who related the story of the six stokers dying on Leviathan, and reminding the audience of the sacrifices made by the men who worked on his grand schemes. This worked, but needed something more. So I gave an additional closing speech to each of the other characters, while Doctor Foster tried in vain to find a cure for his distinguished patient. Old Father Thames reprised his introductory speech with a discussion of Brunel as engineering errant knight; Little Johnny Jack told the story of the completion of the Clifton Suspension Bridge as a tribute to it's designer, and the extent of the Great Western Railway empire; Bold Slasher talked about the investors who lost money in his grand schemes but still supported him, with quotes based on some contemporary obituaries, and Old Leviathan compared the fate of the Great Eastern with that of the ss Great Britain, abandoned in the Falklands but yet to return to Bristol as a fitting reminder of a man without measure. The play concludes with all the top hats being removed as a mark of respect; but of course it's not the end, as we've still got a morris dance to undertake, so we all have to invoke the final revival of our hero. Brunel lives! We enjoyed glorious sunshine on 12th September and our five performances of the play were well received, as was the sixth on the evening of the 15th. As a result of a chance meeting on the day, we were invited to perform the play again a fortnight later at a private event at Bristol's mansion house for a local tourism company, in the presence of the Lord and Lady Mayoress of Bristol. How could we refuse? Altogether our audiences totalled about 700. The costumes and props we hired and borrowed have now gone back to their respective owners, and that is the end of the play, for the time being. A mummers' play is at its heart a tale about life and death, healing and resurrection. Examining Brunel's life and death in this way felt almost entirely appropriate for the occasion, but with enough potential for inappropriateness to make it interesting, and almost slightly risky. But Brunel was never risk-averse. And neither is Rag Morris! When all is said and done, though, we have to remind ourselves that this is just a comical (tragical, historical) play, and we are just a bunch of morris dancers, after all. And that's just fine. Further photographs of the performances can be see at: http://www.flickr.com/photos/fds_gavin/. Glad to see Brunel being immortalized in this way. I live close to Neyland, in South West Wales, and his spirit is very much encaptured in that place, too. There is a bronze statue of Brunel on the waterfront, looking just like the characters in the mummers play here. I enjoyed reading what was written about this mummers play, thank you for passing on the information. I hope to see the likes in Neyland one day for myself, if the fates are kind.